The updated JORC-report, recently released, shows 955 koz of minable gold resources at a gold price of 1,200 USD/oz. A new exploration and development program for the Krasny license has been agreed and started. Kopy Goldfields continues to provide exploration services to the Krasny project for another year. New gold mineralization has been discovered in the Krasny North structure. The Kopylovsky deposit is now being prepared for pilot testing. A limited exploration program on the Northern Territories has been commenced. On May 26, 2016, Kopy Goldfields announced an updated JORC mineral resource estimate for the Krasny deposit. The updated estimate is issued by Micon International Co Limited (“Micon”) and shows a total of 955,000 oz of gold, including 288,000 oz of Indicated mineral resources (7,848,000 tons of gold-bearing material at an average grade of 1.141 g/t Au) and 667,000 oz of Inferred mineral resources (12,324,000 tons at an average grade of 1.682 g/t Au), all within an economically minable open pit. This means that the boundary of the open pit outlines and includes only the part of the total gold mineralization in the ground that can be exploited with profit at the current market conditions. The picture of the open pit is presented on Figure 9 in the Attachments. It can be seen that some Krasny gold mineralization is currently left outside of the open pit as it cannot be exploited with profit at the current gold price and operating costs and hence it is not included in the amount of the gold resources reported by Micon. However, this part of the gold mineralization that is currently left outside of the open pit might become minable if the market conditions improve. The open pit will then be expanded to include this part of mineralization, resulting in an increase of gold resources. The opposite procedure is also possible if the market conditions would deteriorate. The decision to proceed to mine development will be taken by the end of 2016. The 2016 program on Krasny addresses the activities needed to make the decision with certainty and as such, this year is a transition year in which Krasny will move from exploration to construction. When exploration on Krasny under a Joint Venture was discussed between Kopy Goldfields and GV Gold in 2013-2014, there was an expectation that only the Upper Structure would be minable at the market conditions on hand at that time. Hence, all exploration during 2014 and 2015 were targeting the Upper Structure. In 2015, the Ruble significantly depreciated against the USD and gold prices increased above the 1,200 USD/oz level. This led to a significant change in the market conditions for gold projects in Russia and also influenced the views of the mining potential of the Lower Structure. Two holes were drilled in February 2016 in the Lower Structure and returned excellent results in both grade and thickness of gold mineralization. Following the positive drill results of the Lower Structure, supported by internal and Micon’s JORC resource modelling, there is now a strong possibility that the Lower Structure within the Krasny deposit is minable. Adding production of the Lower Structure to the financial model of Krasny will significantly increase financial results. During 2016, we schedule infill drilling of the Krasny Lower Structure with a primary goal to upgrade the category of the Lower Structure resources which are mostly of the Inferred category at the moment. The new drilling program totals 10,460 meters of core drilling and includes targets with numbers 0 – 5 on the map presented on Figure 3 in the attachments. In addition to improving the quality of gold resources, we also plan to potentially increase the total volume of resources, both in the Upper and Lower structures, by drilling on the Western and Eastern flanks of Krasny mineralization. Within 2016, we also plan exploration on other potential targets, apart from the Krasny deposit but still within the Krasny license, see targets 6 – 11 on the map in Figure 3 in the attachment. Total volume of this prospecting drilling amount to 4,150 meters and 3,790 meters of exploration trenches and all prospecting targets are supported by historic evidences of gold mineralization. With the proposed exploration activities, we shall be able to estimate the total resource potential of the Krasny license including both the current Krasny deposit and other mineralization. This will allow us to make better judgement over location and capacity of the processing plant to construct. During mineral processing tests in 2015, it was discovered that the Krasny deposit has two types of ore – oxide and primary – with different gold recoveries if the same gravitation-flotation-tailings leaching processing scheme is applied. Gravitation-flotation technology provides high recovery, above 90% for the primary ore and lower recovery of 75-83% for the oxide ore. 10% variation in gold recovery for the oxidized ore creates a great difference to the financial results and during 2016, a new bulk mineral processing test will be carried out in order to develop the final mineral processing flow chart and optimize the mill parameters. As part of the feasibility activities, we proceed with more tests of rock properties in order to optimize the open pit parameters. In addition, we proceed with geotechnical surveys to identify the optimal locations of the mill, waste dumps, tailing ponds and other infrastructure items. The proposed mineral processing and engineering studies constitutes an essential part of the Feasibility Study report, as they trigger the transition from mineral resources into reserves. It is a fact that there are placer gold resources within the Krasny license based on the evidence from already operating placer deposits (run by other parties) within the boundary of the Krasny bedrock license. Last year a new placer license located within the boundary of the Krasny bedrock license was acquired and added to the Krasny project; see Figure 1 in the attachments. During construction of the mine and infrastructure, some soil and ground from the top of the Krasny bedrock deposit and surrounding alluvial license areas will be stripped. If it turns out that this ground contains a commercial amount of alluvial gold, this can instead be produced with profit and cover some CAPEX costs for Krasny bedrock mining. This alluvial mining will have synergies with the Krasny bedrock development. During 2016, a limited exploration program is planned to estimate the grade and volume of available alluvial gold to make a further decision over its development on a merit basis. The program includes 3,235 meters of trench sampling and 888 meters of percussion drilling, 74 holes in total, to be developed during June-September 2016. The outcome of the program will serve for the decision to proceed with placer mining in 2017-2018. Majority of the Krasny exploration budget will be covered by funds left in the project since 2014-2015 explorations. According to our Joint Venture agreement, GV Gold was supposed to take over the operations at the site in 2016, but we are glad to have been entrusted with the task of providing exploration services to the Joint Venture for another year. Drilling under the new exploration program was commenced in April 2016 and so far 2,563 meters of core holes were drilled and 2,304 assay tests completed (see Table 1 in the attachments for mineralized intervals above 0.4 g/t cut-off grade). The most important result so far comes from prospecting hole # 141706, drilled on the Northern structure located approximately 4 km to the North from the Krasny deposit, marked as target 9 on the map in Figure 3 in the Attachments. This hole returned a strong evidence of new gold mineralization discovered: 10 meters thickness with an average grade of 1.4 g/t at the depth of 30 meters, and 6 meters with an average grade of 2.7 g/t at the depth of 60 meters (see Figure 5 and 7 in the attachments for location of this hole and the cross section along the drill profile. See Table 1 for grades with more details). For the current Krasny deposit such mineralization would most certainly be minable. This mineralization in the Northern structure discovered by the hole # 141706, is also confirmed by historic exploration trench sampling developed along the drill profile. Despite the two other holes (# 141700, # 141707, see Figure 5 and 7) drilled in the same drill profile and returned no exiting results, we see similarities between this hole and the former discovery holes on the Krasny deposit: Back in 2011 with our first exploration program, only two holes out of 9 holes drilled on the Krasny mineralization crossed the structure, all other 7 holes missed it. We now proceed with trench sampling within target 9 in order to better understand the position and orientation of the new mineralization. Later during the summer, we will proceed with more drilling on this potential structure. The next positive results are coming from the holes #141078 and #141079 drilled along profile 47 (see Figure 4 and Figure 6 in the attachments). This profile is located in the Central part of the Krasny deposit, between the profiles 46 and 48 which were drilled in February 2016 and returned very strong results for the Lower Structure (reported in Press release #6, issued on April 11, 2016). Both new holes confirm and extend the mineralization outside our current model. Similarly important, they confirm an extension of the Upper mineralization to the depth and an intersection with the Lower mineralization (see Figure 6 in the Attachments). This will have a very positive impact on the mining economics. As it is presented in Figure 8 in the Attachments (cross sections A-A, B-B, C-C), the Upper and Lower mineralization are currently modelled separately from each other with a gap between them: the volume of ore mined is decreasing significantly when mining proceeds from the Upper to the Lower structure. This results in a temporary sharp decrease in gold production and impacts the cash flow very negatively. With these new results, we will smoothen this transition between the structures and improve mining economics. During 2016, we will do some minor activities on our other projects. The Krasny project is proceeding according to plan on its path to construction and production and in order to prepare our other projects to move along a similar pipeline, we will commence geochemical survey on the Northern Territory project and prepare for pilot testing on the Kopylovskoye project. Total area of the Northern Territory project is 1,852 km2 (182,500 ha) and it is split into 6 properties. Geographically, the project is located in the North-East of the Bodaibo area; approximately 250 km from Bodaibo (see Figure 1 in the attachments). By the consensus geological opinion, the license area is recognized for high potential of elephant gold discoveries. The area is known for a long history of successful alluvial mining and within our bedrock licenses there are still a lot of active alluvial mines. The alluvial gold production in the area has historically reported a lot of pristine gold grains, not reshaped gold grains, which directly indicates for existence of the bedrock source of alluvial gold nearby. The geology and age of rock in the area is similar to that of Sukhoy Log, with stratigraphy, lithology and structural setting favorable for primary gold mineralization. The area reported numerous secondary gold halos, zone and points of gold mineralization, many grab samples with gold. No serious and consistent bedrock gold exploration, however, has been conducted in the area to date. We are not going to commit an expensive exploration program. We stay within our strategy to do initial prospecting and exploration and then develop the projects in partnerships. Our target is to finance the first stage, which is the least expensive and carries low risk of failure. Following the 2016 exploration program, we shall be able to present new anomalies and compare them with historic ones. This will give us a very compelling story to present to a future partner. During 2015-2016 we noted a return of investor interest to the Kopylovsky project. This was triggered by the current low cost gold mining environment in Russia which followed the Ruble devaluation and strengthening of gold prices. Most investors looking at the Kopylovsky project wish to perform a verification test for the historic resources before entering the project. This year we plan to renew exploration and mining permits for the Kopylovsky project and potentially run a bulk sample test to confirm grades and volume of mineralization. Operation updates will be released on a regular basis. För pressmeddelande på svenska se bifogat dokument (Swedish). Kopy Goldfields AB (publ), listed at NASDAQ First North in Stockholm is a gold exploration and production company operating in one of the most gold rich areas in the world; Lena Goldfields, Bodaibo, Russia. 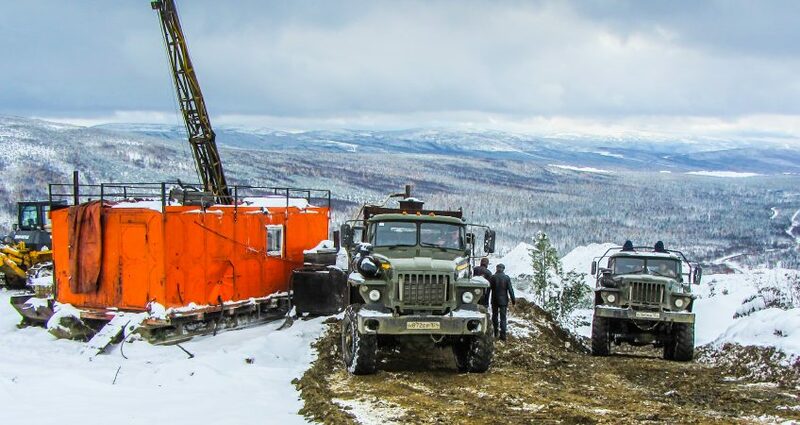 The company holds 11 bedrock exploration- and production licenses and one alluvial license covering in total 1,963 sq km, of which the Krasny licenses (bedrock and alluvial) are held 49% by the company. The preliminary forecast is to be in production in 2018. The target for Kopy Goldfields is to become a near-term gold producer in cooperation with a producing partner under JV agreement. Kopy Goldfields AB applies International Financial Reporting Standards (IFRS), as approved by the European Union. Aqurat Fondkommission acts as Certified Adviser, contact number: +46-8-684 05 800.